Throughout the night, as the pain intensified, I kept telling myself that they were only “Braxton Hicks.” Finally, after a fierce contraction that left me lying on the floor in a fetal position, I woke up my husband and said that I needed to go to the hospital. He called his mother instead. After 20 minutes or so, she showed up, touched my belly, and said, “She’s in labor,” so we drove to the hospital. After four more hours of labor, our son was born. My husband was overjoyed. He literally ran up and down the hospital corridors to tell people that his baby was born. The nurses had never seen anything like it, and rather than take the traditional Polaroid picture of mother and baby, they took one of father and son. 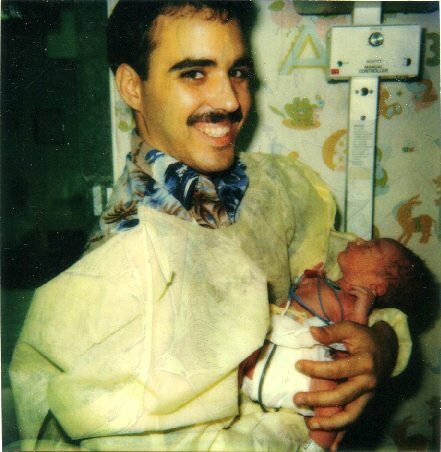 The nurses told me that they had never encountered a father so happy about the birth of his baby before and that’s why they took a picture of him. My husband was thrilled with the birth of each of our four children, and he has been a good father to them. Thank you for setting a good example for our three sons to follow— I hope they will be good fathers to their children as you have been to them.